Occasionally, a Brownie will perform so many heroic deeds that he becomes an inspiration not only to Brownies, but is even recognized amongst the Satyrs. Brownie Masters are keen and able fighters who ride deadly Killer Snails and Squirrels to enhance their speed and battle prowess. Sprytes gain more knowledge of magic as they grow older and they become increasingly revered by other Sprytes. Some become so powerful that they become May Queens or Fairies. 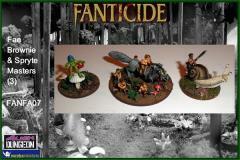 A Fairy is but a tiny figure amongst the warbands of the Fae, but has powerful magical attacks. 1 Spryte on a Mushroom with bases.